Will Bank of America Raise Its Dividend in 2017? The bank stock has gained back a lot of ground recently, but can it keep boosting its payout? Bank of America (NYSE:BAC) took an especially hard hit during the financial crisis in 2008, and it has taken longer than some of its big-bank rivals to rebound fully from the crushing blow the stock suffered after the end of the housing boom in the mid-2000s. Even after its comeback, Bank of America still trades at less than half its pre-crisis levels, and its dividend pales in comparison to what it paid out to shareholders in 2007. Yet slowly but surely, the banking giant has found ways to build its business back up, and investors now hope that dividend growth will become a sustaining element of its success going forward. Let's look more closely at Bank of America to see whether it's likely to raise its dividend in 2017. It's not obvious now, but Bank of America spent most of its history as a favored leader in the industry, especially with respect to dividends. The bank was a member of the prestigious Dividend Aristocrats, posting 30 years of consecutive annual dividend increases up until mid-2007. For much of that period, Bank of America targeted double-digit percentage boosts to its payout, keeping dividend growth at a rapid pace. At its peak, Bank of America paid $0.64 per share each and every quarter, which at the time represented a yield of more than 5% even before the stock started to collapse in anticipation of the financial crisis. Yet all that came to an abrupt end in 2008. At first, B of A tried to address the need to conserve capital by cutting its dividend by just 50%. The resulting $0.32 per share payment still represented a sizable yield in the 4% to 5% based on where the stock traded in October, but it soon became apparent that losses would be much more substantial. In the end, Bank of America reduced its quarterly dividend to just $0.01 per share, citing "continuing severe economic and financial market conditions." 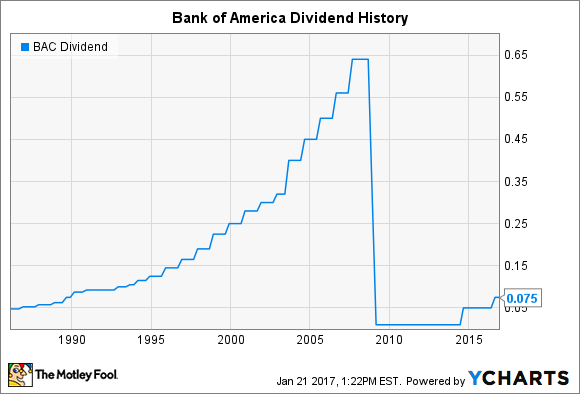 Thereafter, the primary source of disappointment came from how long it took Bank of America to get its dividend back up. Some of its big-bank peers in the industry managed to restore some of their cut dividends as early as 2011, pointing to recoveries in their businesses that justified more aggressive returns of capital. However, B of A's request for a 2011 dividend increase was denied by the Federal Reserve. Given that setback, the bank didn't even ask for increased dividends in 2012 and 2013, and it wasn't until 2014 that Bank of America finally gained approval to quintuple its dividend to $0.05 per share. Yet even at that level, B of A's yield amounted to less than 2%. For a stock that had routinely traded with a 3% to 5% yield, that setback represented an identity crisis for Bank of America in the eyes of many shareholders. Moreover, now that the bank is starting to recover more fully, even the 50% increase that investors got last year still has the stock's dividend yield stuck between 1% and 2%, which isn't where those who own the stock want to see it. However, Bank of America has hopes that it will be able to keep raising its dividend in the near future. As CFO Paul Donofrio told analysts at an industry conference last year, "We have a goal of getting our dividend to 30% payout. I'm not saying we're going to get there right away, but that still is our goal." B of A's recent share-price surge could swing the pendulum back toward dividends. With the stock having sagged, the bank had incentives to use stock buybacks rather than dividends to return capital to shareholders. Yet as valuations become closer to historical norms for B of A, buybacks become less attractive, and that might well lead management to seek greater growth on the dividend front. With that in mind, it's reasonable to expect that Bank of America will seek permission to boost its dividend by a third later in 2017, assuming that the stress tests go well. That will bring B of A's quarterly payout to an even $0.10 per share, and it will put the payout ratio right at the 30% mark. Such an increase wouldn't restore Bank of America's pre-crisis reputation as a dividend giant, but it will still mark incremental progress for income investors.